Most log file analyzers require organizations to set up their own servers and custom environment. Configuring, managing, and maintaining this setup is a resource-intensive and complex exercise. A lot of teams depend on open-source, free web log analyzers for their log management. Many of these log analyzer tools can get very slow when searching massive log volumes. Some tools offer a powerful CLI but can lack the ability to produce detailed charts and reports using smart analytics. Unwanted alerts arising from traditional event log analyzers can lead to alert fatigue. SolarWinds® Loggly® makes log management and analysis simple with a simple setup and configuration that helps you get started quickly. It has an agentless architecture that makes deployment faster. Furthermore, Loggly offers both the server and application-level logging, which means you can have a single interface to capture and monitor all your logs at a lower operational cost. By creating a single source of truth for your distributed team, you can ensure that issues are resolved quickly. To upload logs to Loggly, you can use either syslog or any other log source (e.g., Fluentd, Docker, rsyslog, etc.) of your choice. 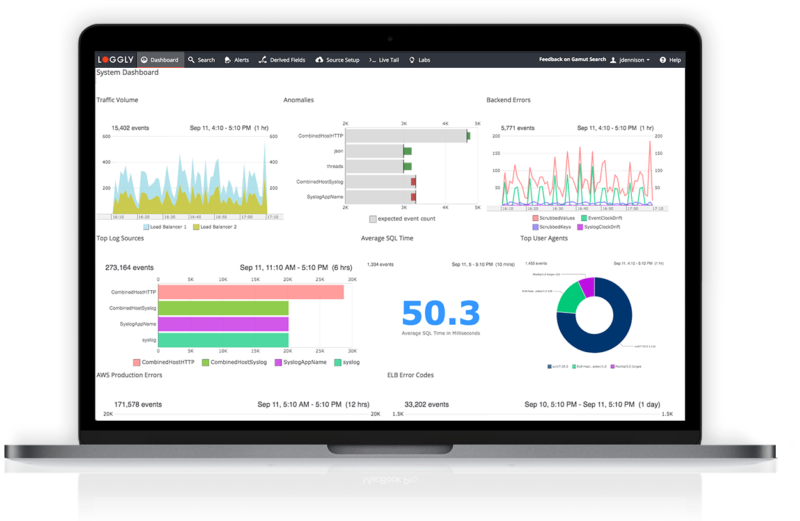 Loggly is a cloud-based log management solution that provides real-time answers to your operational questions without requiring you to log into individual servers or learn complex commands. Loggly’s Dynamic Field Explorer offers a convenient click-and-browse experience with a structured summary of all your log data. This ensures you don’t have to start your searches from a blinking cursor on a blank console. Loggly is highly efficient in searching through current as well as past data, which helps in faster troubleshooting across the entire distributed stack. Furthermore, Loggly links exception logs to the source code with GitHub integration. This makes it possible for your team to find the exact line of trouble-causing code with a single click. Loggly helps you make sure that everyone can monitor logs in a highly visual manner using advanced charts and interactive dashboards. The dashboards help you monitor important metrics and other indicators and can be displayed on large screens for everyone to be on the same page. Loggly automatically analyzes log data over a period and keeps track of trends in different time frames, which allows your team to detect anomalies without fail. Moreover, you can click a spike in the dashboard to find associated logs for further troubleshooting and analysis. Unlike traditional count-based thresholds, you can also specify a threshold in relative terms using standard deviations in Loggly. This feature makes it easy to set up the right kind of alerts and reduce false alarms significantly.